that will advance your knowledge and power. An Instant Classic—Nothing like it anywhere! Gun stores have sold out as countless Americans are flocking to their local retailers seeking to buy firearms and exercise their right to keep and bear arms, as our own government threatens to cut off this precious American right. But how do you get straight information on the how and why of gun ownership, when the media and schools are filled with little more than fear, hype and propaganda? 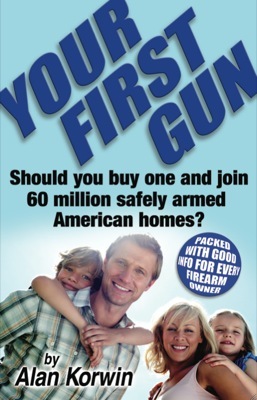 This wonderful new book cuts through the trash talk, avoids the technical jargon, and in simple Q&A format answers the questions newcomers have about becoming gun owners for the first time. What should you get, what about safety, how do you learn the ropes, where do you start so you don't look like a greenhorn fool and can enter this traditional American pastime and honorable pursuit in a calm and collected intelligent way. A whole new world awaits -- you'll learn more in a few pages than with some gun guy who drowns you in numbers and tech talk. Read more. 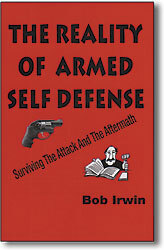 After you shoot in self defense you face a possible murder trial. How do you protect yourself from that? Does a frantic 911 call for help hurt you? This is groundbreaking protection for the innocent. Five different solutions to the problem, and more. Scores of experts weigh in on what to do and how to avoid prosecution and loss of your life savings. Don't let the system nail you after you nail the bad guy. Includes the controversial "Adnarim" (reverse Miranda) statement, and model language for the proposed 911-Limited-Immunity Law. Read more. Every nation has gun rights, gun stores, ranges, gun buffs -- but you’re supposed to believe only crazy Americans have any of that. That’s a lie designed to demoralize you, see for yourself. These are fundamental human rights understood and exercised worldwide. See how 64 nations -- including your homeland -- treats it, some better and many worse, but this global struggle for freedom exists everywhere. If you travel abroad, know what’s up ahead of time. 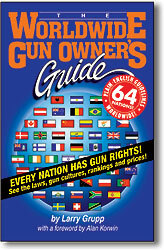 Every nation is ranked for relative firearm freedom, with results that are surprising (the U.S. is not #1 on the list). Fascinating reading, will change your perspective. Read more. Women don't fight like men -- no bragging or machismo, it's about getting away from danger, whatever it takes, and fierce defense of kids and family. 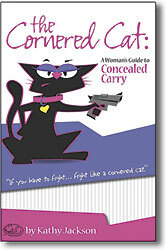 The editor of Concealed Carry Magazine brings her enormous talent and experience to this book for women, an excellent addition to the limited material available specifically for women. Covers all the bases, an all-around guide for carry and use. Intense first-person expertise shines through this clear no-nonsense book. Even if you’ve studied the subject, you’ll learn a lot here. Very practical, from the personal experience of a very successful range owner who has trained thousands over the past two decades. He has analyzed shooting incidents involving his students, interviewed the participants, and testified as an expert witness. 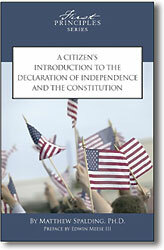 The book is simple and straightforward, short chapters, no fluff, excellent. All the incidents described are based on his direct knowledge of actual cases. Mark Walters and Kathy Jackson, 186 p., $8.00 Closeout save $8! Walters is the host of the nationally syndicated show Armed American Radio, Jackson is editor of Concealed Carry Magazine, what a combo! 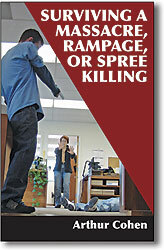 Some books talk about gunplay, this on tells it like it is, from real-life episodes. What happens when an anti-gun democrat lawmaker gets mugged and could’ve died? He gets a gun and changes his stripes. How do you feel years after your gun saves your life, and you only had to point it and never fire it to stop an attacker? 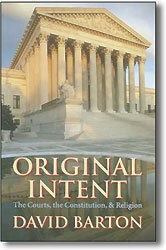 Get the real deal in this fascinating, well-written book. 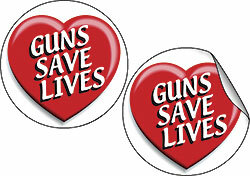 Use them on greeting cards, mail, your gun cases, anywhere you want to help get this message across. Cheap enough to use without worrying about the cost. Where them to political rallies, and give them out too! NEW! Full roll of 1,000 for only $50! Our best goods -- and a price savings! Get all five of our supercharged political novels for one low price -- and read yourself into bliss. Get the first 5 DVDs for one low price! You get the first five Armed Response videos -- the introductory Fundamentals, the intermediate Tactics and Techniques and the advanced Dynamic Drills, plus the stunning Shoot/No Shoot Scenarios and the legal issues in Responsible Use of Lethal Force. With one decision you cover the bases and get hours of intensive training that will put you head and shoulders of your current readiness. Get together with friends and watch them over a period of time (so much better than regular TV! ), or simply enjoy them at home at your leisure. An exceptional training opportuinty at an exceptional price. 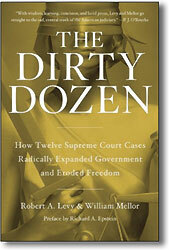 Robert Levy and William Mellor, 304 p.
Closeout price $6, a smokin' deal! 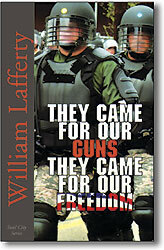 William Lafferty, 176 p., $12.99. Artfully weaves the news you’ve seen—Ruby Ridge, Waco, an AR-15 misfire used for a trumped-up machine-gun trial -- into a tense tale of federal agents doing everything to deny our freedoms and assault us. Captures the dilemma we face, motivates you to press for change. A handful of patriotic people (including senior citizens) decide to take direct action against ATF -- and other forces in government help them to succeed, because the rogue ATF agency is going to ruin it for the rest of the power brokers. Very strange bedfellows adds to the drama. 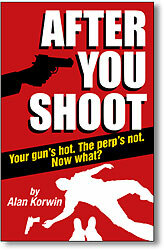 The Hollywood-style excessive-violence parts, like what happens when a 3,500-grain solid-brass projectile traveling at 2,800 fps, from a homemade .950-caliber rifle hits an ATF limousine's engine block moving at 70 mph, will help you overlook some minor plot-element weaknesses in this decidedly non-mainstream novel. 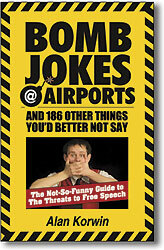 Bookstores don't carry books like this! 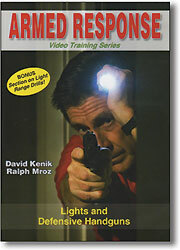 Self defense incidents typically happen in near darkness, making lights a primary safety accessory. Flashlights have come a long way, this video covers the various lamp types, output levels, how much light is needed, switch options, shooting techniques, using flashlights for impact, more. 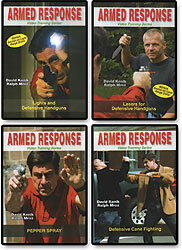 Get Armed Response 6, 7, 8 and 9 for one low price. Increasingly popular as the technology has improved, myths make these great tools somewhat murky, and have obscured the pitfalls and advantages of laser sights. 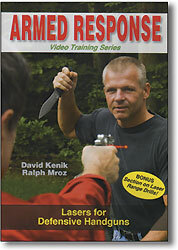 The video covers using lasers for sighting, close-quarters combat, moving targets, using cover, provides real-world range drills, using lasers with flashlights, more. Non-lethal options can be crucial in the self-defense continuum of force, and non-lethal assaults, which are more common than deadly ones, often require a less-than lethal response. 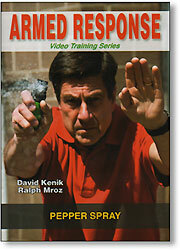 This video covers pepper spray vs. mace, spray patterns, carry methods, relative heat and effectiveness of various sprays, traveling with sprays, more. 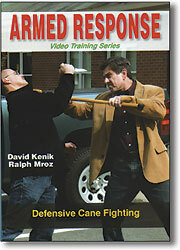 A cane is an exceptional defensive tool and can go where weapons are banned. Clearly explains and shows hand and foot work, strike zones, blocking, fighting styles, one- or two-hand uses, power creation, more. Get the four videos seen here and described above -- released as a series by these outstanding producers -- for one low price. If purchased separately, $79.80. Get all four for only $64.80, you save $15! 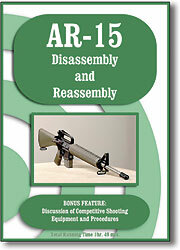 Crystal-clear closeup video and detailed instructions for the most popular general-purpose rifle in America today. Crystal-clear closeup video and detailed instructions for cleaning and maintenance of these increasingly popular carry guns. The video covers the Kel-Tec P3T, I.O. Hellcat, Ruger LCP, Taurus TCP, S&W Bodyguard, Sig Sauer P-238, Colt Mustang, Bersa Thunder, Walther PPK, Browning BDA and the Beretta Cheetah. 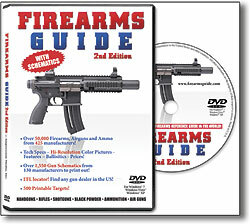 Works for virtually any guns you have, all in one DVD. 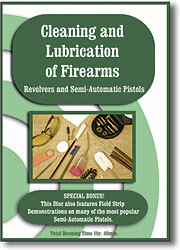 Keep your guns in proper working order by keeping them clean and smoothly functional. 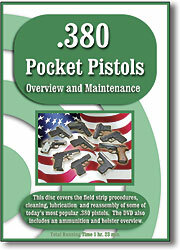 This two-disc set covers an astounding 50,000 firearms, with 1,500 schematics, color pictures, ballistics data, prices, even a national FFL list. 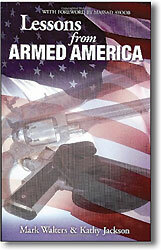 If you want the details on the world's guns at your fingertips, this is the item for you.